Russian city; capital of the government of Volhynia. It is one of the oldest towns in European Russia, having become part of Lithuania in 1320 and being one of its prominent towns in the middle of the fifteenth century. As late as the middle of the seventeenth century, however, there were probably no Jews there, or else their number was very small, for the destruction of the city during the uprising under Chmielnicki in 1648 is not mentioned in the records of the Volhynian massacres of that year. When Zhitomir became part of Russia in 1778, it had a large Jewish community, and was a center of the Ḥasidic movement. In 1861 it had 13,299 Jews in a total population of 40,564, and owned one large synagogue and twenty-six small ones. In 1891 the Jews numbered 24,062 out of a total population of 69,785, while the number of large synagogues had increased to three and the small batte ha-midrashot to forty-six. The Russian government regards Zhitomir as the central point of the Jewish population of southwestern Russia, as Wilna is considered the Jewish center of the northwestern part of the country. The printing of Hebrew books was permitted only in these two cities during the monopoly of Hebrew printing from 1845 to 1862, and both of them were also chosen as the seats of the two rabbinical schools which were established by the government in 1848 in pursuance of its plans to force secular education on the Jews of Russia in accordance with the program of the Teutonized Russian Haskalah movement. The rabbinical school of Zhitomir was considered the more Jewish, or rather the less Russianized, of the two (see "Ha-Meliẓ," 1868, No. 40). Its first head master was Jacob Eichenbaum, who was succeeded by Ḥayyim Selig Slonimski in 1862. The latter remained at the head of the school until it was closed (together with the one at Wilna) in 1873 because of its failure to provide rabbis with a secular education who should be acceptable to the Jewish communities. Suchastover, Gottlober, Lerner, and Zweifel were among the best-known teachers of the rabbinical school at Zhitomir, while Goldfaden, Mandelkern, and Paperna were among the students who later became famous in the Jewish world. The teachers' institutes which were substituted for the rabbinical schools were scarcely more satisfactory, and the one in Zhitomir, which was probably the worst-managed Jewish institution in Russia of which there is any record (see Prelooker, "Under the Czar and Queen Victoria," pp. 8-21, London, 1895), and of which Jonas Gurland was inspector from 1873 to 1880, was closed in 1885. The present educational institutions of the Jewish community include a Talmud Torah, a "government school" for boys, a girls' school, and several admirable private schools for both sexes. The other Jewish communal institutions of Zhitomir are considered to rank above the average in excellence. Wolf (d. 1800), author of the "Or ha-Meïr" (Koretz, 1795), a pupil of Bär of Meseritz and one of the leaders of early Ḥasidism, and Abraham Bär Mavruch, "rosh bet din" or acting rabbi of Zhitomir in the first half of the nineteenth century and author of the "Bat 'Ayin" (Zhitomir, 1850), are two of the few noteworthy rabbinical authorities of Zhitomir; indeed, the town has never been a center of rabbinical learning. Its best-known "crown rabbis" have been Lev Bienstok, Kulisher, and the present (1905) incumbent, S. Skomorovsky, who has held this position for nearly fifteen years. Ḥayyim Naḥman Bialik (b. in Radi, Volhynia, 1873), who is considered the ablest of the younger Neo-Hebrew poets, was educated in Zhitomir. About twenty Jews were killed and a large number were wounded during the disturbances which occurred in Zhitomir on May 7 and 8, 1905, when the section of the city known as "Podol" was devastated. Among the dead was Nicholas Blinov, a Christian student, who fell while defending the Jews, and thus acted in real life the part of "Boris" in Chirikev's drama "Yevrei," which he had often played as an amateur on the stage. Ten young Jews who started from a neighboring town to assist the Jews of Zhitomir were killed in the village of Troyanov, near the city. After the massacre of Zhitomir a committee was organized to collect money for the families of those who had been killed; it received about 33,000 rubles from Russia, 9,500 from England, 1,500 from Germany, and 6,000 from the United States. The district of Zhitomir outside the city contains 22,636 Jews in a total population of 281,378. The earliest Hebrew book printed in Zhitomir bears the date of 1804. After the misfortune which befell Moses Schapiro at Slavuta (comp. Hillel Noah Steinschneider, "'Or Wilna," pp. 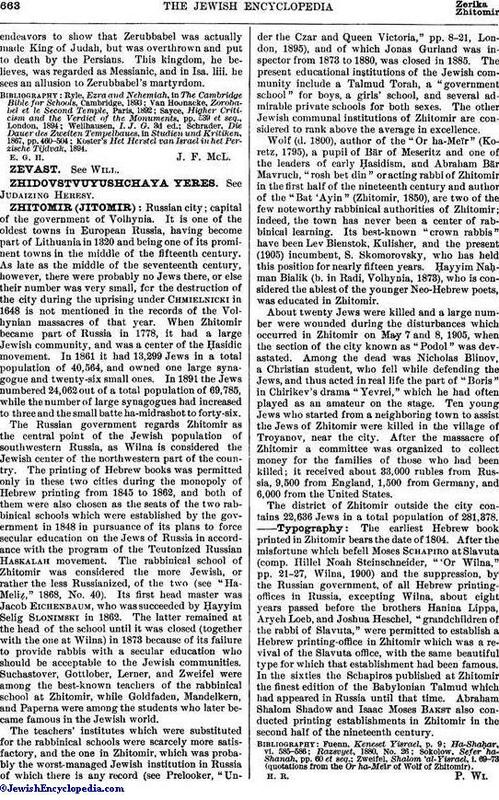 21-27, Wilna, 1900) and the suppression, by the Russian government, of all Hebrew printing-offices in Russia, excepting Wilna, about eight years passed before the brothers Hanina Lippa, Aryeh Loeb, and Joshua Heschel, "grandchildren of the rabbi of Slavuta," were permitted to establish a Hebrew printing-office in Zhitomir which was a revival of the Slavuta office, with the same beautiful type for which that establishment had been famous. In the sixties the Schapiros published at Zhitomir the finest edition of the Babylonian Talmud which had appeared in Russia until that time. Abraham Shalom Shadow and Isaac Moses Bakst also conducted printing establishments in Zhitomir in the second half of the nineteenth century. Zweifel, Shalom 'al-Yisrael, i. 69-73 (quotations from the Or ha-Meïr of Wolf of Zhitomir).